As the death toll from the April 16, 7.8-magnitude earthquake in Ecuador continues to rise, the magnitude of the disaster comes more clearly into focus. The earthquake struck off the west coast of Ecuador, injuring 2,500 people and killing nearly 500. According to USGS estimates, the disaster has the potential of claiming an estimated 1,000 lives. Agence France-Presse reported Tuesday that about 1,700 people remain missing. 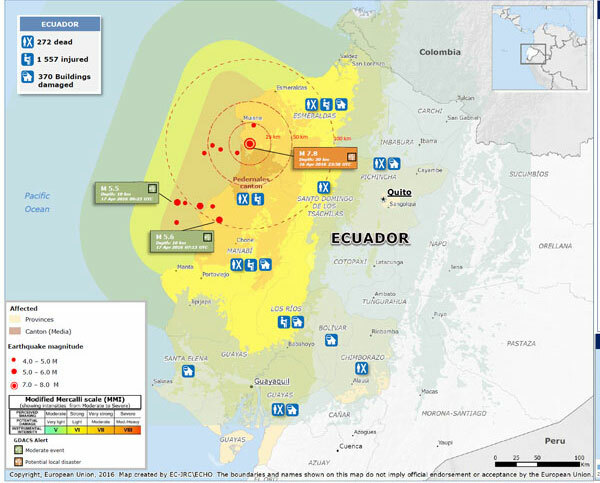 The area severely affected is huge, stretching more than 200 km along the Ecuadorian coastline. More than three million people experienced strong ground motion and thousands more aftershocks are expected. The United Nations reports that thousands are in severe need of relief and thousands more are without basic needs. 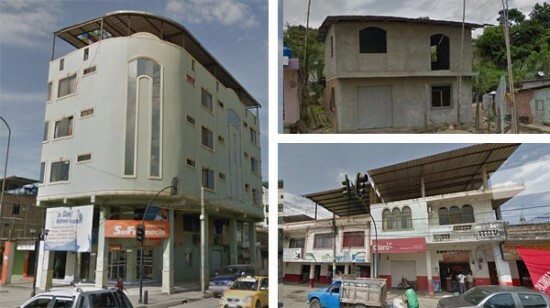 The heavily hit city of Portoviejo has a population of about 250,000 and is the densest region affected by the quake. Seven major cities felt severe-to-very-strong shaking, which lasted for more than one minute in some areas. Initial government reports state that 805 buildings were destroyed and 608 were damaged. Miyamoto, who has conducted large-scale damage assessments in regions hard hit by earthquakes, estimates that this number may exponentially grow in the next few weeks once building assessments begin. 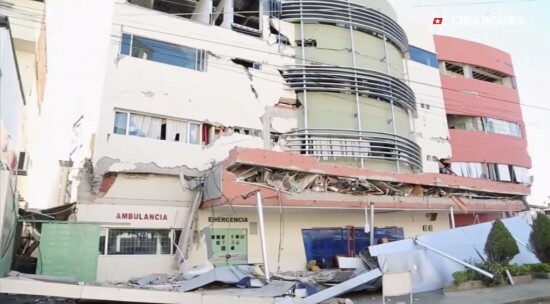 In Portoviejo and Chone, two hospitals collapsed entirely. 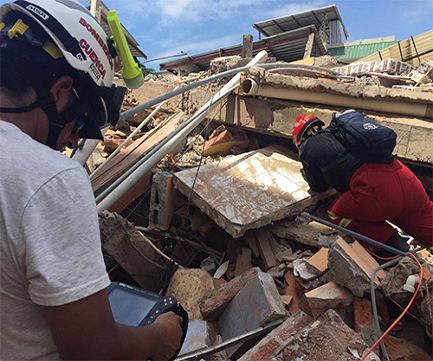 Photo Credit: USAR Pasto- Search and Rescue continues. Aftershocks keep coming. The earthquake will impact the lives of at least 150,000 children, the UN Children’s Fund (UNICEF) reports. Preliminary surveys show at least 119 schools have been damaged or collapsed. Although Ecuador is a mountainous country, much of the populated cities near the epicenter rest on soft-soil plains. As earthquake waves move through the soft soil, they are amplified and the motion can create a resonance that’s more damaging to taller buildings. Older concrete buildings are extremely dangerous for this type of strong shaking.